The community of artisans is global – in the Nest Guild alone, artisans from more than 46 different countries around the world are represented. When artisan business leaders from one country meet with those of another, whether through Nest’s Remote Learning Center, Professional Fellowship Program, or Artisan Leadership Summit, they tend to surprise both Nest and themselves with the trove of similarities they uncover. Challenges to production efficiency for a Shibori dyer in Japan are not unlike the issues faced by Batik artisans in Indonesia. The commonalities are striking and important to acknowledge when designing effective business development programs. The United States is a part of this global community of makers – and an important one at that. In 2014, Nest had the great fortune to meet Natalie Chanin, for whom the art of making is deeply ingrained in her heritage, personal identity, and connection to her home state of Alabama. For the past two years, Natalie has helped Nest to look closely at Alabama’s textile traditions including the women who have both shaped and been shaped by them. 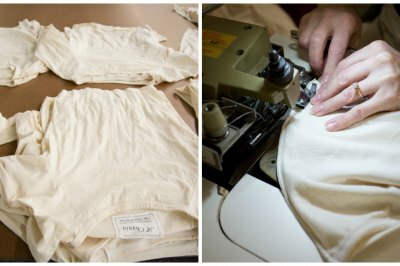 We have sought to recapture what has been lost in American textile manufacturing and work alongside Alabama’s veteran seamstresses to bring it back. We will continue applying lessons from around the world to explore their applications even in Nest’s own backyard of the United States. We look forward to the projects like these that will emerge. Please enjoy this video on Nest’s School of Making Project with Alabama Chanin. WATCH IT HERE.